Between the Wedding Diet and my more recent approach to counting calories, I’ve obviously been thinking a lot about food. Part of the point of The Wedding Diet was bringing consciousness to certain foods and figuring out how I reacted to cutting each one out. But as I’ve moved past that approach, I’ve started to think less narrowly (i.e., what happens when this one thing goes away?) and more broadly (i.e., what happens when I eat anything?). Physically, emotionally, and otherwise, what life do I create as I ingest each bite? A good friend told me that “food is the place where we develop and exert our integrity.” This is not just integrity in the sense of following through on our commitments – our ability to stick to a diet or maintain our veganism over time. Beyond that, our food choices also reflect our integrity of living in alignment with who we are and what we value. I, for example, variously value health, convenience, appearance, social connection, cultural experience, tradition, sustainability, and frugality when I decide what to eat. Not all of those values are reflected in this morning’s espresso or my mid-day fried rice (real-life menu choices for today), but my choices are the more-or-less successful reflection of a constellation of values I strive to honor. I am what I eat – from the molecules that make up my food to the values which my food reflects. And you are too. You can imagine that we all eat from a veritable pu pu platter of values every day. But here’s the thing about values. You can’t honor all of them all the time. It’s tough to find the afternoon snack which is at the same time frugal, healthy, and communicates your sense of adventure. So we make trade-offs. We give up some things to accommodate others. I know that I won’t always be the perfect reflection of my values. But my hope is that I can keep on consciously choosing what I eat. I’ve learned over the past months that I don’t live better by excluding sugar or including dairy. I’ve learned that I eat best when I eat consciously – conscious of not only the basic gastronomical dimensions of what and how much, but also the why and the how. And with that, I am finishing defrosting the ratatouille – the most tangible manifestation of my values of health, appearance, and frugality you’ll see from me all day. 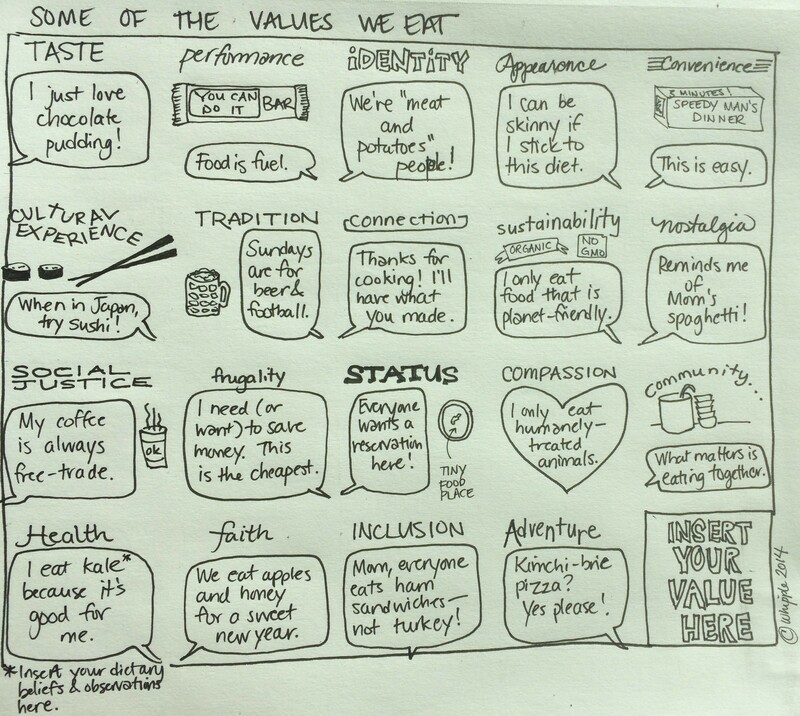 What values do you aspire to eat? What values did you eat today?